The jalore city situated in the Rajasthan state of western India was a flourishing town in the 8th century. The Kirtipala the youngest son of Allaha former ruler of Nadol laid the foundation of Jalore line of Chauhans. In the historic being such a significant city the place is dotted with large number historic monuments. Some of the majestic forts and palaces have been renovated and converted into heritage hotels for visitors to experience the glory of bygone years. 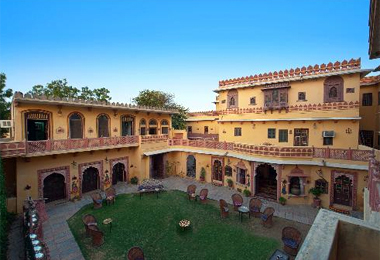 Stay at one of the heritage hotel of Jalore is sure to allow the visitors the best of Rajasthani culture, hospitality and tradition. This majestic palace remains unspoiled by the commercial ambitions of man is appointed with all modern days facilities to allow one to rejuvenate one’s senses. So next time you plan to visit Kuchaman, book your stay in the heritage hotels of Kuchaman by HeritagehotelsofIndia online portal to avail great discounts.